I found this photo on a dance directory listing for suppliers in South America. 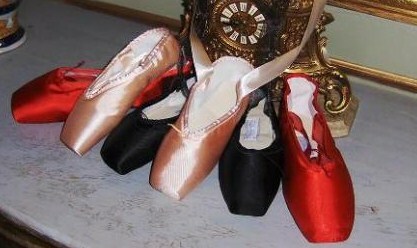 These pointe shoes are being sold as De Verona. In Spanish, when you use the “De” it means of or from. These pointe shoes are either of Verona or from Verona. Verona is a city in Italy, so I am guessing that these are an Italian brand. Very mysterious! Update: This mystery has been solved. Read more about these pointe shoes in my updated post DeVarona Of Mexico. This entry was posted in Mystery Pointe Shoe Brands and tagged De Verona, Italian pointe shoes, Pointe Shoe Brands. Bookmark the permalink. I appreciate your request and if you have another ballet related site I would certainly consider it. I’m afraid our sites are completely unrelated and would cause confusion for your readers and mine.